Interviewer: Well the Mid West Task Force was set up following job losses at Dell… we’re joined by it’s chairman well known business man Denis Brosnan. Can we deal first with the Reports recommendations about reducing labour costs. How important a part of this Report are those recommendations? Brosnan: I don’t think it’s labour costs alone… basically the country itself and the mid-west region has become cost uncompetitive. It’s the total area of costs… in the mid-west there’re fewer tourists coming because we’ve priced ourselves out of a lot of markets. In the area of manufacturing we’ve priced ourselves out of markets… so it shouldn’t be labour, virtually in all areas of costs in Ireland are out of line with any competitor. Interviewer: And what are the specific proposals in this report about reducing those costs? Brosnan: Well the report is basically about unemployment and how to reduce it. There are 36,000 on the Live Register this year… it’s growing rapidly. It’ll peak at 50,000. So what we’re saying to government is in the short term all you can do is get people to stay in education, have community schemes, get involved in infrastructure. In the second half of the Report we’ll look at how to create jobs, but it’s impossible almost to be looking at the creation of jobs as we continue to lose them and as we do virtually nothing about cost-competitiveness. Interviewer: We heard earlier from FG TD Kieran O’Donnell, he welcomed the job creation proposals in the report but he shied away from any suggestion that there be a reduction or review of the minimum wage or decreases in social welfare payments. Brosnan: Well we’re not [sigh]… we said they need to be looked at. Everybody has a choice to make. Perhaps Government more than anybody else has a choice to make that we cannot get new manufacturing to come into this region or to many parts of Ireland while we’re uncompetitive in the area of labour, but let’s not think of labour alone, we’re seriously uncompetitive in the area of energy, which is electricity and gas, we’re seriously uncompetitive in many other areas, the area of professional services, everywhere we’re uncompetitive so if we don’t tackle it…then we have the choice of very high unemployment until people can emigrate again. Interviewer: So in other words will this exercise have been pointless unless the Government doesn’t take on board the recommendations on making ourselves more competitive. Brosnan: I don’t think they have to take on board all our recommendations but certainly it makes the task almost very difficult if not impossible for IDA, Enterprise Ireland and all the agencies to persuade foreign investment that Ireland is a good place to invest. Interviewer: Will the final report touch on rationalisation of the agencies themselves. You saw the McCarthy Report recently suggest that Shannon Development shouldn’t have any role in the future creation of jobs and its functions should be transferred to Enterprise Ireland and the IDA. Brosnan: Well we’ve met all the agencies. We’ve met 24 bodies in compiling this Report and part of our second stage and final report will be to get the agencies back and we want to meet them, and we think there’s a lot of duplication there. Whereas we mightn’t go as far as McCarthy which was very much get down costs get agencies under control but certainly there is duplication there and we find we have found for investors that they’re very much confused who they go to. They would like a one-stop-shop. Interviewer: So the final Report could well recommend that there be some elimination of red tape. And so on… there’s a wrap up where Brosnan reiterates that people staying in education and job growth is the only way to prevent people joining the Live Register. That’s a depressing prospect, isn’t it? Fintan O’Toole makes some good points in the Irish Times this week. Got to admit I’ve slowly come around to his viewpoint on the National Pension Reserve Fund, a viewpoint which is shared by McCarthy (and again, note how hegemony operates. Near everything in the public discourse on these matters relates back to the alpha and omega that is McCarthy). Both argue that payments should be stopped into the NPRF. The reasons? From the time the McCarthy group on public spending was established last autumn, there was one absolutely obvious candidate for the chop: the 1 per cent of GNP that we’re paying every year into the National Pension Reserve Fund (NPRF). This is a no-brainer. It’s not just that we’re putting about €1.7 billion annually into a black hole. It’s that we’re now borrowing that €1.7 billion at high interest rates. The analogy with going to the money lender to get the money to bet at the bookies is pretty exact. For anyone who is not so far gone in idiocy as to be actually wearing cap and bells, there really is no argument here. Last year, the return on our investment in the NPRF was minus 30 per cent – almost a third of the money disappeared. The overall return on the billions we’ve put into the fund since it was established by law in 2000 is 0.6 per cent. We’d have done better if we’d simply put the money into a post office savings account. This is so appalling a waste that it’s almost laughable… Actually, if they had invested in the PO in the form of saving bonds you’d get 10% interest after 3 years and with savings certificates 21% interest after 5 years… okay, I’m kidding. But only slightly (and isn’t that an echo of the PwC report on Pensions released on Monday which argued that pension fund managers should – and I paraphrase – stop playing the market when investing funds and put such monies into ‘safer’ government bonds etc). And O’Toole, rightly, has kind words for McCarthy. If the McCarthy group was to have any credibility at all, it was always going to recommend that we stop throwing good money after bad, particularly since the NPRF is not counted as part of the General Government Balance, and therefore doesn’t affect our borrowing limits. And O’Toole notes something very very important there. If we were to stop the NPRF payments of €1.7 billion we’d already be over half the way there to preventing the cuts recommended by McCarthy and supported by the ESRI at the weekend, where the younger FitzGerald argued for €2.5 billion to be removed from public expenditure. Now, as I’ve noted here previously, I actually find some elements of McCarthy to be eminently sensible, more than might perhaps be expected – for example I can live with the public pensions reform he suggests, a reform of some allowances and certain work operations is long overdue, the creation of a single employment market within the PS is an excellent idea, and I’d even go further than he and his in terms of tax reliefs, etc – and I have no problem at all with a state undertaking periodic reviews of expenditure, so I’m willing to accept that there are cost savings and efficiencies to be discovered hither and yon. Not as many though as advertised. And not necessarily in the places that certain cheerleaders of slash and burn would have us believe. Given that though, stopping, even for a limited period, the NPRF payments would at the very least allow those savings and efficiencies to be made in an atmosphere which was less charged, less ‘hurry hurry’ and more reflective. It would even, whisper it, allow for some elements of savings to be diverted to some form of fiscal stimulus. There’s just one problem. Knowing that the McCarthy report was going to recommend that the NPRF payments be suspended, you would assume that the Department of Finance held off on handing over this year’s money. Astonishingly, it not only made this year’s payment early, it has also handed over most of next year’s as well. The department, presumably with the full approval of the Government, has deliberately sabotaged the most obvious and least contestable recommendation of the McCarthy report. The National Treasury Management Agency’s report last week confirms the receipt of “€3 billion from a frontloading of the Exchequer contributions to the Fund for 2009 and 2010”. Knowing, at it must have done, that McCarthy (or anyone else with a stim of wit) would insist that we stop borrowing money to put into a fund that lost a third of its value last year, the Government decided to “frontload” the payments. It didn’t just borrow for this year’s trip to the bookies, but for next year’s as well. Odd that. O’Toole believes it is simple if ‘breathtaking’ hypocrisy. I can’t help wondering whether this is oversight (hardly unlikely given the mess this lot have walked us into), or ideologically driven… in other words the calculation is that it is necessary for the ‘pain’ to be inflicted and seen to be inflicted. I think it’s more likely to be the latter than the former. FOUR MONTHS ago the most pressing question in some quarters was whether Ireland could continue to borrow to finance a soaring budget deficit that was slipping further out of control. The answer was that it could do so with increased difficulty and at a higher financial cost. Foreign lenders sought ever-higher returns to compensate for the greater risks associated with a shrinking Irish economy – which may contract by 2 per cent in the three years to 2010. Note the ‘some quarters’ formulation. I’ll return to that in a moment. In March, the yield difference – or spread – between Irish and German ten-year bonds had touched a record high. Ireland, as a sovereign borrower, was paying far more than Germany to issue government debt – almost 3 percentage points more – even though both countries share a common currency, the euro. Now, you may be less surprised at such a spread despite the ‘sharing of a common currency’ the ‘euro’ (for those of us asleep under a rock for the past decade). The Republic of Ireland and the Federal Republic of Germany. One exiting an economic boom/bubble, the other the powerhouse of Europe. Compare and contrast. That yield gap has since narrowed, and the differential is now closer to 2 percentage points. As Ireland’s borrowing premium has declined, so too has the annual cost of servicing the national debt, which represents some welcome news for taxpayers. What is the reason for the sharp turnaround? Certainly, international investor sentiment towards Ireland has improved greatly in recent months, despite the loss of the country’s triple-A credit rating in March. Michael Somers, chief executive of the National Treasury Management Agency (NTMA), which borrows for the government and manages the national debt, has detected a noticeable shift in attitude by international investors, plainly impressed by the Government’s plan to stabilise the public finances by 2013. In financial markets, however, sentiment is notoriously fickle. Fears of debt default, and suggestions that Ireland might be forced to seek sanctuary with the International Monetary Fund (IMF) may well have seemed greatly exaggerated, given Ireland’s low level of government debt. Nevertheless, at times of great financial and economic uncertainty, markets may be moved as much by sentiment as by more fundamental concerns. The success in changing a negative international perception of the Irish economy into a much more positive one, as measured by a reduction in borrowing costs, does represent a considerable achievement. It helps achieve stabilisation of the public finances, which is the foundation for economic recovery. The Government can take some credit for what Dr Somers has described as the “huge change in general sentiment towards Ireland”. Finance Minister Brian Lenihan impressed international investors needing further reassurance about Ireland’s creditworthiness during his recent tour of major financial centres. Note that ‘may well have seemed’ in the first sentence of that paragraph. Again, I’ll return to that. Note also the acceptance of the essential irrationality of market ‘sentiment’ at certain points. And then… cue the pain! That said, as Dr Somers has warned, international investor sentiment could also quickly change for the worse. A second rejection by voters of the Lisbon Treaty would prove greatly damaging in international markers. So too would any sign the Government lacks the political will to meet the tough budget targets required to stabilise the public finances. Much of the renewed confidence of international investors in the Irish economy is now based on the Government being able to keep its word, and deliver the tough medicine it has promised – regardless of the political consequences. Right. Okay. So to assuage market ‘sentiment’ we have to ‘deliver tough medicine’ although the reasons for the tough medicine appear less pressing and the options available to ameliorate the treatment are rapidly coming into focus. Maybe it’s me but that doesn’t sound like governing, it sounds like punishment. IRELAND IS rapidly moving towards the abyss of national bankruptcy. The Government’s response, with its forthcoming budget and other measures, must be proportionate to the dangers. It is difficult now to overstate the magnitude of the crisis in Ireland’s public finances. One in four euro spent is being borrowed. The gap between revenue and expenditure is widening with each passing month. Public debt is exploding. So are debt servicing costs. In January and February alone, €175 million was spent paying interest, up a staggering 64 per cent on the same period in 2008. Most of this money left the country. This haemorrhaging will not only continue, but will gush with ever greater force unless every possible measure to staunch it is taken with all due haste. O’Brien made something of a cottage industry of pieces about ‘national bankruptcy during March and April this year. DELIVERING A budget on April 7th that is tough enough to save the country from bankruptcy is an awesome responsibility for Brian Cowen and his Government, but it could also be a liberating experience to throw all political caution to the winds and stake everything on one bold move. The Government’s problem since last summer is that it has been too slow to face up to the truly staggering scale of the problem with the public finances. International capital markets have lost confidence in the Government’s ability to deal with the public finances, and the April budget is the last chance to restore it. While it is true to say that no government, anywhere, has managed to get to grips with the combination of a banking crisis and the economic downturn, the fact of the matter is that the Irish response is regarded as one of the worst in the developed world. That is reflected in the fact that it is costing Ireland more than any other European Union country to raise borrowing. Huge cuts in welfare rates as well as in the pay and pensions of public servants would automatically follow intervention by the European Central Bank or the International Monetary Fund. That is why the controversy over the public sector pension levy is so futile. In the scheme of things the measure is relatively mild and reasonably fair. While it understandable that the people affected don’t like it, they must know that it is necessary in order to avoid far worse. They had fed the fires of a massive public borrowing and spending spree for five years. Now that foreign lending has dried up; the property bubble has deflated and exchequer revenues are some €18 billion in deficit, Ministers refused to acknowledge that they are part of that past. Any semblance of an apology, even an acknowledgment of possible mistakes, did not rate in their political vocabulary. The prospects for an all-party political recovery plan and emergency tax-cutting measures are remote with such amnesia. In a way that’s the worst of the lot (and by the way that’s a, I believe, representative sample in terms of that sort of rhetoric in the IT during that period, albeit these are the most exaggerated examples) since it’s factually incorrect that in March 2009 foreign lending had dried up. On Wednesday 24th of March the IT reported that NTMA had sold €1 billion in long-term bonds at auction. A week or so later it raised €1.5 billion in T-bills. And in January the NTMA borrowed €6 billion. …the NTMA has raised €22.7 billion from the bond markets out of total borrowing requirement for the State of €25 billion. For further bond auctions are planning between now and November. An economist friend said the other night: “We are ruined.” He was referring not just to Brian Lenihan’s extraordinary remarks on Sunday night, but to the potentially catastrophic mess the Government has made of the public-service pensions levy. It seems now that either the Government would have to back down, as they were forced to do over several of the budget measures, or there will be strikes in the public sector. Either way, my economist friend believed, we would be unable to borrow the money we need to keep the show on the road. Therefore ruin. Ruin. Every little bit helps, as the saying goes. Now there is a counter argument that might go, look we’ve had an emergency budget and now we’ve had a report. The government has given tokenistic assurances of its intention to deal with this matter. The situation was dreadful, or potentially could have been dreadful if nothing were done. No doubt there is an element of truth in that, but… the appetite for Irish bonds was strong throughout the earlier part of the year well before a sniff of Budget 2. The McCarthy report is as of yet entirely unimplemented, although one national cultural institution, I know of has a meeting with the Dept. of Finance imminently as regards it’s future survival – so in some areas the groundwork is being done to see what is feasible and what is not. And there was never at any point from any serious voices on left or right a sense that nothing should be done. The debate has focussed on the strategies out of this situation, and the severity of it, not a belief that there is no situation to address at all. Look back at the Irish Times editorial…Fears of debt default, and suggestions that Ireland might be forced to seek sanctuary with the International Monetary Fund (IMF) may well have seemed greatly exaggerated, given Ireland’s low level of government debt. But even at the time there were alternative voices arguing that they were then greatly exaggerated, but these voices were given remarkably little prominence. You think I mean left-wing voices? Think again. For example, what of this unusual piece in the Irish Times from February 2009 by Charles Dumas of Lombard Street Research (LSR, and economic consultancy in the UK, was founded by economist Tim Congden, a British monetarist, no friend of fiscal irresponsibility him) which argued that “Ireland is not a basket case”. And Ireland’s financial problem? Would that we all had such problems! Ireland has virtually no net government debt. The banking sector is indeed large. Total deposits on the broadest definition are about 130 per cent of GDP. Suppose the financial sector needs to be recapitalised at one-fifth of this balance sheet (an extreme assumption). Then Irish debt would rise by less than a quarter of national income, depending on the actual losses emerging, and would remain well below most other countries, including all the major Europeans. Meanwhile, the widening of Government bond spreads against German bunds must be seen against the falling absolute level of the latter. Current Irish 10-year yields are an affordable 5½ per cent. They look a much better risk-adjusted bet for investors than Germany’s debt at just over 3¼ per cent. It’s odd how that particular viewpoint hasn’t been more widely articulated, despite it being much much closer to the truth of the matter both then and now. The cost of repaying interest on Irish national debt will rise from 3.8 per cent of tax revenues in 2008 to 18.7 per cent in 2013, according to the State’s debt manager, the National Treasury Management Agency (NTMA). In its annual report for 2008, the NTMA said the sharp increase in borrowing requirements is due to the deficit in the Government finance. It says while the burden of interest repayments will increase “it will be no greater than the levels experienced in the mid-1990s”. Chief executive of the NTMA, Dr Michael Somers said the market sentiment had improved significantly in recent months and that there was increased demand for Irish Government debt. “This week alone we had an auction of bonds for €1 billion we had cover for somewhere between €3 and €4 million demanded and the yields that we paid were significantly below what we had been paying earlier in the year,” he said on RTE radio this afternoon. Mr Somers said there had never been any question that the State would not repay what was borrowed. Part of the reason for the change in sentiment was the fact that the NTMA has kept a “huge mountain” of €25 billion in cash available meaning it can easily meet any repayment demands. Well, that is good news. Although wouldn’t it be nice to see the Government think about how it could fund some degree of a fiscal stimulus given that fact? Even just a little, a bit, something, anything. A second factor was that even now, Ireland’s debt to GDP ration was relatively low relative to other euro member states. Wait… isn’t that the letter to the spirit of what Dumas said way back when? And not just Dumas. But, note the discrepancy between the headline and the contents of the story. Once the Irish Times was a fairly staid, relatively sober creature. Never as left-wing, or even liberal, as it liked to think itself, but dependable for all that. And now? Here’s a puzzle here, at least for me. The week the McCarthy Report was released we heard this. ECONOMIST COLM McCarthy, architect of the “Bord Snip Nua” proposals, presented the measures as a central strand of the Government’s four-year plan to rebalance the public finances and reduce the requirement to borrow €400 million a week to run the State. Arguing that the Government was paying the penalty interest rates on its borrowings – in excess of two percentage points above the rate Germany pays for equivalent 10-year loans – he said the current dependence on international capital markets “can’t go on”. It was not possible, he said, to continue borrowing at that rate and “very, very dangerous”. Stating that it was wrong to conclude that the credit crisis was over, he said there was no guarantee that any government could sail through borrowing at the current level without encountering hiccups on the bond markets. “The idea that the measures taken to date are going to get us out of the woods is just not an option,” he said. The corrective measures taken to date had reduced this year’s deficit to a little above 11 per cent of gross domestic product (GDP) from a potential 15 per cent. However, it would be very unwise to attempt a repeat of the practice in the 1980s when governments borrowed the equivalent of 10 per cent or 11 per cent of GDP for the best part of a decade. …that it was difficult to know when the IMF would move in, if corrective measures were not taken. The Government, he added, was borrowing nearly €400 million a week. This had to be reduced, and there was a risk that the Government would find difficulty borrowing if it was not done. Of course we have got to stop borrowing at the rate of €450 million a week and we have got to cut back significantly on our spending. But there is another way of looking at this and one such way which is to see this as a communal problem. ‘…nearly’ €400 million, €400 million, €450 million? With the State borrowing €480 million a week just to make ends meet, it is the collective task of the Government, Opposition parties and social partners to ensure that the forthcoming reform of Irish public expenditure and taxation is not only fair and equitable, but also of sufficient scale to ensure fiscal stabilisation in the medium term. Thing is… even taking the original figure there are problems. One is that McCarthy doesn’t quantify the impact of the savings that he’ll make in relation to the €400 million and the vagueness of the text in the Report leaves a lot to be desired. Granted there is a breakdown of the projected figures he arrives at to calculate the debt, or rather the figures he was given and you’ll find them in the first five or six pages of Vol. 1. And yes, they do seem to support the €20 billion or so which would lead to outgoings of €400 million per week. But they are based on our situation in April 2009. The Report doesn’t mention the €400 million figure at all and is surprisingly coy about the effects of the savings. Which, as noted by Michael Taft, is a curious omission since he has had every opportunity to do so. We know that the savings that McCarthy recommends are of a scale of €5.3 billion. Except they’re not since they couldn’t be realised in a single year and many couldn’t, for either political or structural reasons, be realised ever. So let’s take the ball park as suggested by the Irish Times editorial, €3.0 billion, to be conservative. That’s higher than the Government says it seeks, but lower than the figures the media are arguing for (actually the ESRI came out at the weekend looking for a somewhat smaller €2.5 billion). That, mapped across a year, which again is a fairly pointless exercise because precisely the same political and/or structural reasons come into play, would leave us with €57 million less spent per week. The result being? We’d no longer be seeing €400 million go out in borrowings per week, it’s now… €343 million. Okay. That seems substantial, but one has to wonder if it’s worth the cost. Thing is it’s not correct. We don’t actually make those savings. Michael Taft has taken the ESRI report projections – which one can argue are the closest to a serious economic analysis of impacts – to map the McCarthy figures and he comes out at a rather smaller figure, presumably through lowered economic activity, etc that would see us ‘reduce our borrowing requirement by 0.9%’. And the figure that would require on a weekly basis? €29 million. Which would leave us still paying €371. But if we then map those savings onto the figures offered by Browne and O’Mahoney… well… we arrive at savings that would seem to indicate that our true situation even after the McCarthy Report were implemented would leave us above the figure that he argues is untenable. In the case of Browne we’re talking about €421 and in the case of O’Mahoney we’re talking about €451. So O’Mahoney’s figure even if McCarthy’s savings are factored in would still be higher than the original McCarthy figure and that of Browne. Frankly, scary as €400 million is, well, €480 million is considerably more scary. Now, why would McCarthy seek to minimise that figure? The only answer I can come up with is that the lower the figure he chooses, the greater the savings appear to be. So €29 million from €400 million is obviously more impressive than €29 million from €480 million. A figure cited most often by speakers at the summer school, and seized upon by audience contributors, was that Ireland is currently borrowing €480 million a week. This figure was parsed repeatedly, into amounts per day, per hour and per minute. One questioner even pointed out how much Ireland had borrowed during the time it took to hear one particularly lengthy speech from the platform. So, even at that gathering of the great and the good of our econometariat that figure had some currency, so to speak. I mean these are economists…. fer’ Christ’s sake. They may not know everything, but one would expect them to know something. And all this, all this, as I noted previously to achieve savings that would be by any yardstick less than stellar, even if we accept McCarthy’s original figures. Add to that the fact, again, that the ESRI at the weekend sought €.5 billion less in cuts than that €3 billion figure Michael Taft suggests with the knock-on reduction in the savings made from implementing the McCarthy proposals. So we’d be looking at less than €29 million. Perhaps closer to €22 million. Astounding stuff, I think you’ll agree. And in a way the actuality of it isn’t the core issue. It’s that we have supposedly authoritative voices issuing two divergent (or is three?) figures into the public domain and expecting us to take them all seriously. I would suggest that this divergency demonstrates the fuzziness of the arguments being made and the positions being taken. If there is such imprecision on the part of economists (let’s put Browne to one side, but let’s remember his figure is lower than that used by O’Mahoney) as to the figures how can we take entirely seriously their absolutism as to the supposed potential outcomes. As ever I have to add a necessary caveat. This isn’t to underplay the seriousness of the situation we find ourselves in. But it is to posit that the choices that are being made appear, from this remove, to be much more arbitrary than I, for one would like. And those choices have actual impacts outside the pages of both McCarthy and our media. For €29 million, or is it going to be €22 million per week we lose, as I listed previously, a tranche of child benefit, free third level education, garda stations, a brace of museums and cultural institutions funded under the D4 Budget of the Department of Arts, the SEI initiative, rural transport, the Western Corridor and so on and so forth. …there had never been any question that the State would not repay what was borrowed. Part of the reason for the change in sentiment was the fact that the NTMA has kept a “huge mountain” of €25 billion in cash available meaning it can easily meet any repayment demands. Think about that… there ‘had never been any question’ that the State would default. That’s what bankruptcy means. That or near-bankruptcy would be the circumstances that would trigger the IMF arriving on our doorstep (indeed much of what I’m reading seems to suggest that it would be the ECB that would act, albeit through local proxies – which actually in a way is precisely what we see already). Fears of debt default, and suggestions that Ireland might be forced to seek sanctuary with the International Monetary Fund (IMF) may well have seemed greatly exaggerated, given Ireland’s low level of government debt. Nevertheless, at times of great financial and economic uncertainty, markets may be moved as much by sentiment as by more fundamental concerns. Is the €400 million figure and the scary rhetoric about the IMF part of that ‘sentiment’? Posted by WorldbyStorm in Communist Party of Ireland, Irish History, The Left. Here it is, the latest Looking Left programme from DCTV. And it’s a gem. It really is. It deals with the Irish Socialist, party paper of the Communist Party of Ireland. We’ve a few in the Archive, but I have to say I think this programme, as it did with the previous three papers it dealt with, really gives a great overview of not merely the paper itself but the time period in which it was produced and the personalities and motivations of those involved. Two parts really stand out to me, the discussion about Betty Sinclair who really is an unjustly forgotten figure in Irish socialism. The second is the discussion about the Prague Spring where the CPI had an open debate and took an extremely honorable line on it. I think that’s often forgotten in the discussions of these matters. As interesting was the fact that the publication of the Dubcek Action Programme was unanimously voted for. It would have been interesting to see what the panel thought about initiatives such as the Liaison of the Left and how that worked in the context of the Irish Socialist but in truth that might be for another programme. And that points to a real strength in this series that it genuinely leaves one wanting more precisely because even in the constrained time period it delivers so much. One small thought… bloody hell… the end title music comes in pretty loud, doesn’t it? I was racing to find the volume control on the computer. I think support for those who made this so successfully is crucial to ensure that the team continues with new material. The Irish left from social democracy, ‘orthodox’ Marxism, Republican, Trotskyist, anarchist, green and feminist has been prolific in producing printed materials. Each of those strands can be unravelled and examined and now there is a means of doing so. Keep it going, this is a great resource both for those interested in where the left has been and where it is going. Posted by WorldbyStorm in Irish Politics, Northern Ireland, Sinn Féin, The Left. I wonder are we seeing some massive shift in the IT psyche as it barely, just about, perhaps, maybe, comes to terms with the fact Sinn Féin isn’t going to go away anytime soon and therefore it needs something else… something more Republican than Republican, more socialist than socialist… something scarifying and with just a hint of an organised conspiracy against the state… you know what I mean. A sort of Workers’ Party c. 1988, but without all those nice articulate near-middle class spokespeople, some of who would later be ushered into the circles of the great and the good. A sort of Joe Higgins like cohort… but more sinister, as strident but not as cuddly. An IRSP without the bloody splits and general mayhem. You know what they mean. You know what they need… they need someone who means it…maaaaan! So, hot on the heels of Fionnuala O’Connors musings about Éirígí replacing Sinn Féin in the South comes another missive, this time from Dan Keenan about that ’emerging and distinctive’ group. Éirígí sees itself as a genuine republican revolutionary organisation, steering itself away from endorsement of violence and denying links with any armed group. It shuns also what it sees as the trap of representative politics Stormont-style. It further denies the oft-repeated claim that it is little more than a split from Sinn Féin over the issue of endorsing the PSNI. Founded in 2006, the organisation, whose name translates as “Arise”, claims to have followed the organisational precedents set by the Fenians and Venezuela’s Hugo Chávez. For them there is little point in a broad-based membership if activism is limited to selling ballots and circulating An Phoblacht. Better to have small and committed “circles” of activists committed to clear political themes. “There are no inactive revolutionaries,” says one. No ‘inactive’ revolutionaries… but… but… that means there are active revolutionaries! Let the fear choke you up and wash you away, at least until you take a trip out to IKEA. Brian Leeson, Éirígí national chairman, claims that since the Belfast Agreement there has been “a massive realignment within Irish republicanism”. “In real terms this means that thousands of republican activists have transferred their allegiance from Sinn Féin to other republican organisations, such as Éirígí. A proven track record of political campaigning, combined with an unambiguous socialist republican platform, has enabled Éirígí to attract large numbers of existing left-wing republicans. “massive realignment”… “Irish republicanism”… “thousands of republican activists”… “transferring allegiance”… erm… how many to Éirígí? Don’t worry, or rather do worry. “In addition a new generation of activists, who are attracted by Éirígí’s message of revolutionary national and socio-economic change, is now emerging. Éirígí’s decision to directly challenge the establishment parties within the electoral arena has further boosted our credibility as a coming political force.” The organisation believes Sinn Féin’s rush towards the nationalist centre ground may have drawn in former SDLP voters, but the shift is costing Gerry Adams his republican soul. “A coming political force”… Jeekers… although memo to Éirígí: Keep it perhaps a tad lower key comrades… rhetoric has to have substance. Otherwise that way disappointment lies. Remember, it took effectively over thirty five years, effectively half a life time for Sinn Féin to get to where it is today… you may not like where that is but it does point up the scale of any project to move towards state power (and note that that is true only for the North, the project in the South hasn’t been faring quite so well…). And you’ll be far from the only Republican party to wind up with a restless activist base, although, crucially, you’ll still lack the trappings of power that help to calm the nerves. Éirígí sources, speaking to The Irish Times in the wake of the Ardoyne riots, claim there is a new furrow to be ploughed in the territory between violence and Stormont constitutional politics. A new furrow? In what way is this different from ‘dissident’ Republicanism in the past two years, or from the plethora of groups who loosely fall into that category. That’s why recruits to the movement must serve out a probationary period, to prove revolutionary credentials, before being fully accepted. A proven track record of political campaigning, combined with an unambiguous socialist republican platform, has enabled Éirígí to attract large numbers of existing left-wing republicans. Well, we’ve had the posters. Then we’ve seen the ‘events’ (those of us who check out indymedia). Now we have the Irish Times – the most unlikely recruitment wing one could think of. Pity Éirígí, dressed up as the fire next time. It can surely only be a matter of months until we hear the dulcet tones of one E. Harris opining on their malevolence, and inevitable rise to power… and what a pity the Cruiser has departed this vale of tears or else he’d be arguing that they were only a step away from making common cause with Rome and Islamd, or is it Islam and Rome, to drag down the pillars of western civilisation and cause yet further harm to the plain people of Ulster. They are not yet registered in the North as a political party and their first tilt at an election may yet be some way off. They say it is better to get it right than get it soon. All that said, still some way to go though, I’d have thought. I was struck by one of our commentors suggesting that, on foot of a response from a Green Party member that morale in the GP camp must be higher than those outside it expect. I think that that’s a very important observation. Because truth is the perception from outside and the view from within (at least in my experience limited as it is) is quite divergent. It’s not that these are considered the best of times, but rather, as evidenced by the recent vote on Lisbon, a sense that there is no alternative. I’ve already raised problematic aspects about that viewpoint which I won’t reiterate here, but that it exists this far into what surely has to be the most difficult period for any government and governing party in at least a decade and a half, and perhaps longer again, is testament to… something. And I could add, that despite wobbles over Dermot Ahern and his seeming one man crusade, and I use the word crusade quite deliberately, relations with Fianna Fáil appear, for the most part, to be good and beyond the expectation of those of us who knew of old the intrinsic GP detestation of that party back in the day…er… a bit before two years ago. I’d love to ascribe this to a form of Stockholm Syndrome whereby the travails of the past year has thrust the two unwilling parties together into an embrace that is the result of fear of the alternative. But truth is that it long predates that, indeed marvellous it was to see how happy they were together under the blessed Bertie. So all told the idea that the GP is about to collapse under the weight of its own misery at the situation is very very far of the mark. It’s all stiffened sinews and resolute jawlines and taking it on the face, whatever fate, the economy and a far from grateful electorate throws at them. Which makes the suggestion in the Sunday Business Post “Backroom” column that Enda Kenny should extend the hand of friendship so unlikely as to be near bizarre. If Kenny was to think outside the box, the options open up. He should start with the desired outcome – a new rainbow of Fine Gael, Labour and the Greens after a general election, with a decent majority and a popular mandate to govern. He would have an opportunity to fix the economy and go into an election in five years with an economy turned around and on the way up again. So how does he get from here to there? Here’s how Backroom would do it. In mid-August, Kenny delivers a major speech. He lays it out in simple terms. The people want Fianna Fáil out of government. The people are willing to take the pain from a new government that has no responsibility for the current mess. That can only come about if there is a general election, which, in turn, can only happen if the Greens cross the floor and vote the government out. Kenny says that he understands the Greens’ dilemma. He appreciates their concern that if they do the right thing, their party will be obliterated and their policy agenda abandoned and forgotten. So far, so good. Then it gets interesting. Enda says that there is much good in the Green agenda. They are decent and competent people in the Green Party. Instead of lose lose, Fine Gael believes in win win. He offers the Greens a political partnership. If the Greens leave government, Fine Gael will enter into immediate and time-limited dialogue with a view to agreeing a policy programme on Green priorities before the election. Fine Gael will give the Greens an undertaking that the agreed policies will form part of any programme for government to be implemented by a Fine Gaelled government. Fine Gael will forma pact with the Greens going into the general election. Fine Gael will commit itself to including the Greens in a Fine Gael-led government, even if the numbers do not make it essential. That participation will include government ministers in proportion to the results of the election. Right so. There is one small problem. Whatever about the sentiment within the GP, the sentiment outside it and amongst significant sections of our political groupings is one of loathing for them. I’m not sure this has sunk through to the GP, in fact I’m almost sure it hasn’t. The left and further left sees them as turncoats (whatever the actual rhetoric they used on a range of issues the perception, and in some cases the actions of those in the GP, appeared to point in quite a different direction). Fine Gael dismisses them almost out of hand, content in the belief that following the next election they will be eviscerated. I’m not so sure myself. I could see them holding onto a couple of seats. Not many, but certainly sufficient to be in, if the figures are tighter than the current polls suggest, for calculations of government formation. And what an irony if Fianna Fáil were able to cobble together a coalition in 2011, or a year later, with the GP playing in its diminished form an echo of the PDs today. But even were the Green Party eager to make this deal with Fine Gael, and assuming that Fine Gael could deliver, what of the impact on their other potential coalition partner, the Labour Party. There surely would be some raised eyebrows over what would appear to be a greater courting of the GP than themselves. That, on economic terms, the GP would arguably be a better fit for FG is neither here nor there. In reality it is only with Gilmore and co. in harness that Kenny can dream of being Taoiseach. An offer along these lines would throw the cat among the pigeons. It would represent a strong leadership initiative by Kenny. It would blindside Labour, who have rejected the idea of a pre-election pact. It also lets them know that they are not the only bride in town! It puts the Green ministers in an impossible position. There would now be a road map which many of their members/voters might find appealing. It would certainly ensure a lively and potentially fractious debate at the Greens’ conference on the revised programme for government. If they reject it (as they are likely to) and stay in government, even with an improved programme, they will be definitively tying their fortunes to Fianna Fáil, and it’s open season on the Greens again. A political initiative along these lines would demonstrate that, just sometimes, the opposition can create a moment of history. What has Enda got to lose? President Mary McAleese has this morning signed the Defamation Bill 2006 and the Criminal Justice (Amendment) Bill 2009 into law. Last night, the President met 19 of the 22 members of the Council of State for nearly three hours to discuss whether to refer two Bills to the Supreme Court. The meeting began shortly after 6pm and broke up shortly before 10pm. Stolen from today’s G2 section of The Guardian. 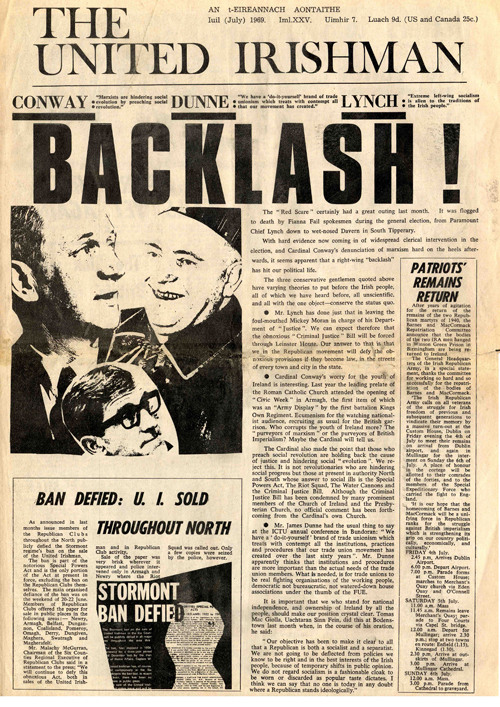 Posted by irishonlineleftarchive in Irish Left Online Document Archive (Remembering 1969), Sinn Féin. “Our objective has been to make it clear to all that a Republican is both a socialist and a separatist. We are not going to be deflected from policies we know to be right and in the best interests of the Irish people, because of temporary shifts in public opinion. We do not regard socialism as a fashionable cloak to be worn or discarded as popular taste dictates. I think we can say that no one is today in any doubt where a Republican stands ideologically”. The other front page story “Ban Defied: U.I. Sold Throughout North” seems perhaps a little tame given what would happen during August. Inside it is surprising how little, relatively speaking, there is on the North. Granted there is a short piece seemingly meant to be read by Unionist. But in the main it doesn’t figure highly. There are useful pieces on Problems of Ideology which intriguingly references Teilhard de Chardin and how his philosophy ‘seeks to reconcile christian theology with the scientific theory of evolution in an intimate and indissoluble way’. Another piece details Palestine. And there’s also one on Zambia. The history of Conradh na Gaeilge is outlined in yet another. There are a number of mentions of the Free Wales Army (and is it possible that they fed into enduring rhetoric about that particular period in history?). The ‘campaign for the re-conquest of Ireland’ has an entire page to itself detailing pickets and fish-ins across the country, certainly detailing considerable activity. The full text of the oration by Tomas MacGiolla is contained within and there’s little doubt that this was an emphatically leftwing address. And the editorial on the back page concentrates largely on the Common Market. All told then a document which truly charts the calm before the storm. Posted by WorldbyStorm in Moon. Well… what of this, Alternative 3, produced for ITV as a spoof documentary in 1977. I remember watching it at the time, I’m not sure if I knew at that time that it was April Fools, although it wasn’t broadcast during April, which sort of undermined the point of the exercise. This, again, was one of those pieces of television culture that were consumed with incredible enthusiasm by myself and my friends. We loved this and would talk about and around the topic afterwards. And in such a way as to nearly gift it the mark of authenticity even though we either knew, or rapidly discovered soon afterwards, that it was a construct. In fact I have a vivid memory from the week after the programme was aired of reading a tiny snippet in what I think was the Guardian saying that it was fake. Well, I’ll stop there and let you discover for yourself. It comes in various parts, which you must judge for yourself whether they are worth viewing. In truth it’s as interesting for the insight into documentary techniques of the period as it is for its content. Ropey title sequence? Check. Stilted interviews? Check. Avuncular older man as presenter? Check. Alcoholic former US astronaut eaten up by a secret too large to be able to contain? er… check. Thing is that this was actually the final programme of a genuine series of science documentaries, Science Report, which Anglia Television had axed. The producers decided to go out on a spoof. And not only but also the theme music and incidental music was supplied by Brian Eno. There’s an accompanying novel, which was pretty silly, but notable in the way it fed into what would later be UFO mythology of animal experimentation. And the programme itself, obviously, can be regarded as a forerunner of all the Moon hoax nonsense or perhaps a sub-genre of covert space programmes and collusion between Soviets and the US. Actually the more I think about it the more it strikes me that this is a perfect encapsulation of future concerns, from ecological disaster to conspiracy theories and so on. I have to say kudos to the sequence at the very end which you can watch here… Houston and Murmansk… yeah. Right. I presume it was taken from a helicopter over a desert or beach, certainly the ‘surface’ of Mars looks convincingly… well… Martian. The treatment of the footage is near brilliant, all crackles and interference. And as with all the best such fictions it leaves one with the wish that it had happened even as one realises it never could.